You’re running late. You managed to find a matching shirt and pants. You’ve done your hair, brushed your teeth and even found your keys. The last thing is to find a pair of socks so you can get out the door. You open your drawer and find…chaos. What should have been the easiest part of this last-minute ritual has become the thing that makes you late. Socks aren’t even paired. You start digging under a layer of gym socks to find a pair of socks that goes with the outfit you selected for the day. There’s no time to find another shirt and pant combination. You have to find socks that go with what you’re wearing. This is a common occurrence, but it doesn’t have to be. 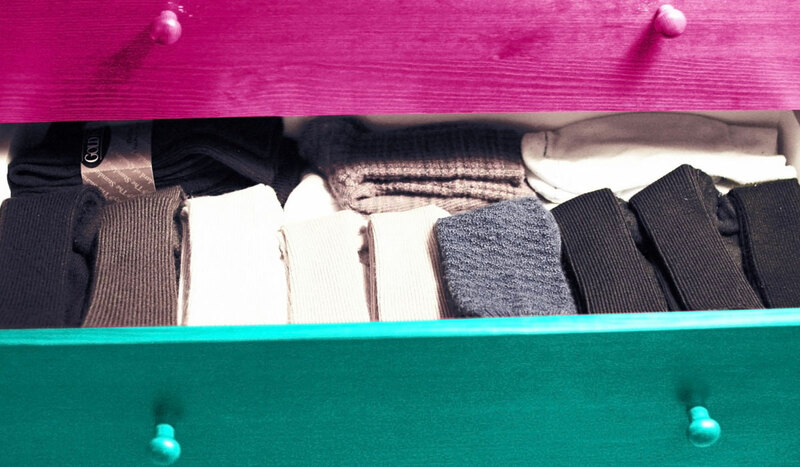 It’s time to organize your sock drawer. By type. If you own a lot of different sock sizes, then it may be best to separate each. Keep your sport socks in one section of the drawer. Separate your winter socks and your summer socks. Make sure your custom dress socks have their own space as well. By occasion. Some people like colorful socks for everything from hiking to casual evenings to formal events. If there’s nothing to distinguish your socks except when you use them, then use that as your criteria. This will ensure that your work socks don’t get worn out quicker by being mistaken for athletic socks. By style. If you own socks that are predominantly the same type and used universally, then consider organizing your drawer by the style and design. Keep socks together based on color and pattern. Put bright colors in one section and more traditional socks in another. Separate your stripes and checker designs from your other designs. Fold stocks instead of rolling them up. This will make them easier to separate and it will prevent the elastic from stretching out. Fold in half, then in half again, then store like pairs together. Use a divider. Just like a divider keeps your silverware organized in a kitchen drawer, the same concept can give pairs of socks their own real estate in your sock drawer. Don’t clog your drawer with socks you no longer wear, especially if they’re worn out. Also get rid of those unpaired socks you kept hoping their partners will eventually show up. Newsflash: they won’t.